Shop Teens Finding Hope, Inc. - Teens Finding Hope, Inc.
High school senior, Maddy, has everything going for her. She earns good grades, is a member of the cheerleading squad, and is on her way to earning a scholarship for college. Everything is working out perfectly...until her best friend betrays her. Somehow she must find a way to stop the abuse and stand up for herself—at home, as well as at school. Choose to purchase the English or Spanish versions below. Finding Rainbows Through My Sister's Depression tells the story of a young girl as she struggles to understand her sister's illness and why it's changing their relationship. She just wants things to go back to the way they were. 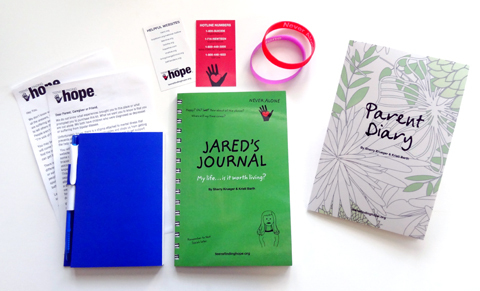 This kit includes Jared's Journal, the Parent Diary, a notebook, Never Alone Bracelet Set and emergency contact cards. This kit offers strategies and encouragement for teens and their parents. A book written from a teen’s perspective on living with depression and how to cope. From a mom’s perspective: this book focuses on how to support your child with depression and the impact it has on your family. The set includes one Red Mood Bracelet that is to be worn ONLY when life has gotten out of control. It alerts your family and friends that you are struggling and reaching crisis mode. It also includes one Purple Bracelet, worn to support a friend or family member with depression.